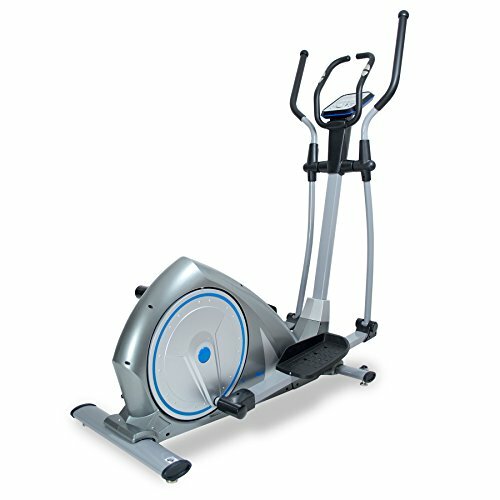 Compared to the budget models on offer, you are getting a solid and reliable elliptical. The total weight is a hefty 46kg (compared to 80+ kg for commercial models and more like 25kg for budget cross trainers). This is a nicely designed machine, with a slimline look compared to many models. The console is compact, 2-colors and gives you a picture of a road to track your progress. You’ll be able to see the calories, distance, speed and pulse rate. There are 15 preset programs, these are represented graphically on the console (with the resistance going up and down depending on your choice. This model does not fold, though it does have wheels for relatively easy movement. 10kg is large for a flywheel on a cross trainer, and the maximum user weight (usually a conservative estimate) is listed at 120kg, which is almost 19 stone. If you have Polar watches / monitoring equipment then these can be used in conjunction with the BodyMax E60. What Previous Buyers of the E60 Cross Trainer Said. There are only 7 comments at amazon.co.uk at the time of writing – though every one of them is 5-star. I always like to look for a theme that runs through all the comments, and this time it is ‘great value for money’. The consensus is that this is a quality product, quiet and smooth. Assembly, which often gets people upset (and dropping stars in their feedback) seems to have been smooth. One reviewer mentioned that this is only 10 screws + tools, though another said that it is easier / faster with 2 people. BodyMax have a solid reputation in other categories (both for their fitness equipment and for home gyms). If you enjoy elliptical cross trainers, and want to avoid the creaky and often wobbly budget end of the market – then the BodyMax E60 could be the right pick. With the current discount this is lower mid-range in price, and has a nice feature set and smooth quiet action. Topping it all off – this model looks great too! Check out the picture gallery, user feedback and latest amazon.co.uk discount for yourself on the dedicated product page now.